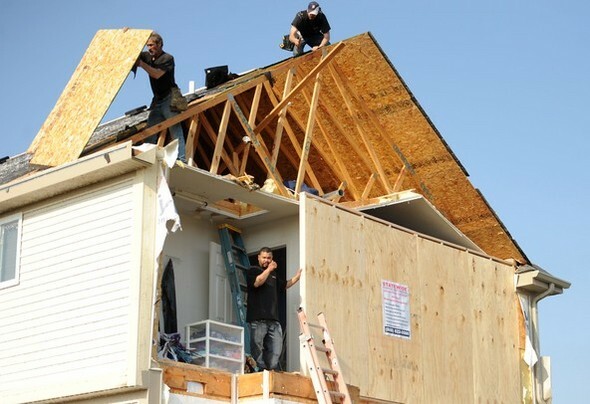 Posted on Fri, Mar 16, 2012 : 6:14 p.m.
Cleanup workers remove debris and reinforce a house damaged by a tornado that hit Huron Farms neighborhood in Dexter on March 16, 2012. With more than 200 people displaced by Thursday’s storm that ripped through parts of Washtenaw County, local hotels have been swamped with phone calls from people looking for lodging. Aside from damaged homes and apartment complexes, much of the area between Dexter and Pinckney is without power because a major electricity line between the two townships that needs to be replaced. Many affected residents have turned to family and friends’ houses for lodging, while others stayed overnight in a shelter at 100 Arbana Drive in Ann Arbor -- a shelter organized by the Red Cross and Salvation Army. Another shelter - located at Mill Creek Middle School in Dexter -- also is available for people to stay overnight or just to come get food, beverages and support. Jenni Hawes, the disaster public affairs coordinator with the Washtenaw-Lenawee County chapter of the Red Cross, said both shelters will remain open for several days as the organization evaluates the community’s needs. Several hotels nearest to Dexter have lowered nightly rates and are running specials in an effort to help displaced residents. John Staples from Weber’s Inn -- which is located about six miles outside of Dexter on Jackson Avenue -- said about 15 rooms were booked last night by people who were affected. They have an additional 20 people coming tonight, and only have one more room available. “I wish we had more rooms that we could offer people, but we’ve picked up a lot of rooms because of the storm. I would imagine, given the circumstances and damage, that probably many guests will be staying with us for some time until they can make other arrangements,” he said. He still encourages people to call to check for availability in case there are cancelations. The hotel is lowering its rate for storm victims from $185 per night to $109 per night, and offering a buy two nights, get one free special. The Clarion Hotel on Jackson Avenue has lowered its rate to $49.99 for displaced residents and still has available rooms, said sales manager Valentine Cabaua. “We sympathize with these people and we are involved in the community,” he said. Another hotel, the Comfort Inn in Chelsea, is discounting its rooms from $114.99 to $65 for storm victims. Front desk manager Veronica Hubler said the hotel has 28 rooms available tonight. Sun, Mar 18, 2012 : 6:57 a.m. The people affected by the storm, while tragic, are covered by insurance and they will not pay anything out of pocket for their hotel stays. The hotels are going well beyond the call of duty by lowering the rates for storm victims. I've seen so many times homeowners get burned out of their home and though covered by insurance accept charity without a second thought. I find it obnoxious, The Red Cross is constantly low on funds yet continue to give insured homeowners resources. While many people without insurance get burned out and left with nothing they are most often from poorer areas and their is no community collection and the red cross may not show up on that side of the tracks. Handling an insurance claim with any skill at all is like hitting the lotto yet I have not seen on one occasion a homeowner turn down the collection. Sat, Mar 17, 2012 : 1:15 p.m. It would have been much nicer if the rooms were free -- the discount is nice, but some folks lost everything, so free would have been a great. Plus, folks remember kindnesses and in the future would most probably use the motel because of it. Fri, Mar 16, 2012 : 11:52 p.m.
WOW, how generous! People get their lives and homes torn apart by a tornado, and they only have to pay $50 to $110 per night for a motel room that would otherwise not be used? Get these motel owners a MEDAL. Sat, Mar 17, 2012 : 12:59 a.m. These people have made the decision not to use the charity shelters that have been set up in the area. I would certainly take advantage of my homeowner's displacement coverage in the same situation. Nice of them to lower rates. Sat, Mar 17, 2012 : 12:39 a.m. I assume that you're letting them stay in your house for free and making their bed every morning, right? Sat, Mar 17, 2012 : 12:27 a.m. It is very generous. They are not charities. Anyone with homeowners insurance and damage may get reimbursed.